Although I have used Todd Friel's Wretched material on occasion, I am a new podcast listener to Wretched Radio. I recommend the show. 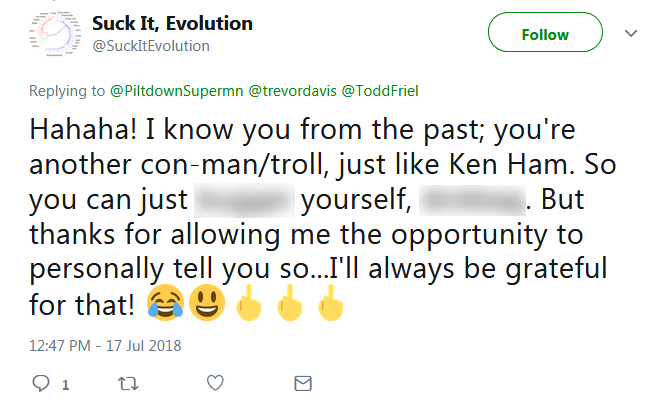 He had a couple of segments that this mostly-unknown creation science writer could use, so I contacted him for permission. I could have gone the Fair Use route, preferred the direct approach. He gave me the go-ahead, and I'll give you the link to the full episode after the video-style excerpt. "He deserves it. All of it." Who are YOU to decide that he deserves it? By what standard? Is it because you hate him, and hate God? "Let's try your "reasoning": I lack belief that atheists can use reason, so they deserve lots of ridicule. Howzat work for ya, Skippy? Wow, I sure am unarmed in a battle of wits with that mocker! That one, and others, proved Mr. Friel right. 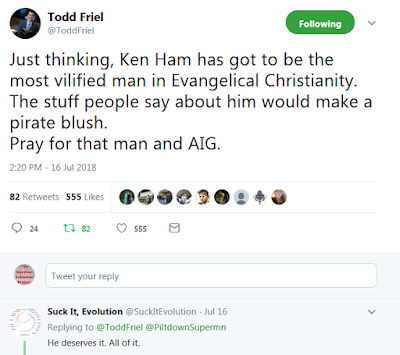 People hate Ken Ham and treat him like a punching bag. I suspicion that it's because he is uncompromising, provides biblical and scientific evidence for his claims, and they are suppressing the truth in unrighteousness. There is more that I'll discuss below. Can anti-creationists give reasoned responses? This guy certainly cannot. 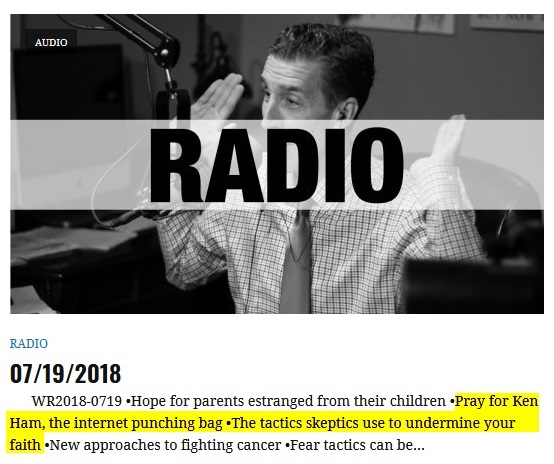 He prefers to demonize people who threaten his worldview with reality, spams people (even when they ask not to be sent his stuff), and has posted hundreds of libelous attacks on biblical creationists. Ken Ham and others ruin some foundations of atheism by refuting evolution and deep time, and supporting special creation. Darwin's loyalists need those years for their own machinations. Notice that old earthers and theistic evolutionists give aid and comfort to enemies of God by saddling up with them to ride for the deep time brand? (I still maintain that TEs are likely Deists because of their low view of Scripture, and the way they treat people who believe that the Bible means what it says.) Members of that gang express disdain for intellectual, religious, academic, and speech freedoms when Question Evolution Day rolls around every year. It's not just Ham, either. 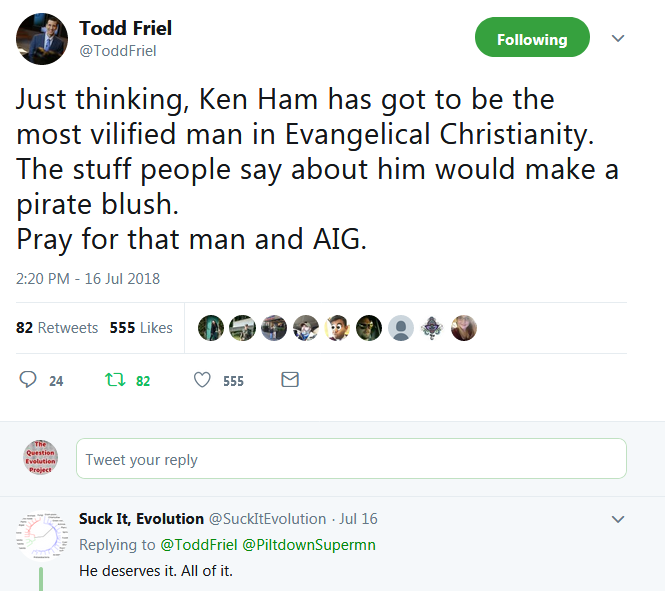 Ken, other biblical creationists, and other uncompromising Christians get attacked. Mr. Friel should not forget Mr. Comfort, for one primary example. I believe that the hatred exhibited for conservative Christians and biblical creationists is because they hate the truth (John 14:6, I John 3:13-14, Romans 1:18-23, 2 Cor. 4:4, Matt. 5:10-11). To unbelievers and those who reject God's Word, we stink in that our existence reminds them that we belong to God and they do not (2 Cor. 2:15-16). Bible deniers, whether professing Christians as well as atheists, are in serious need of repentance. Someone attacked Eric Hovind on my Cowboy Bob Page on Fazebook. Fake name, of course. I was going to copy 'n' paste some remarks, but I think the marshal of Fake Name Enforcement caught up to him. 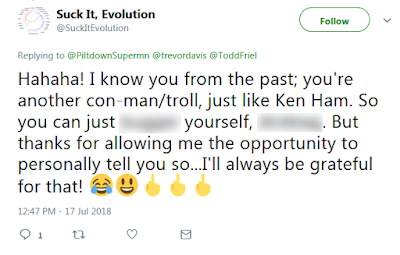 He made numerous assertions about Eric, and when I challenged him to back up his claims he (wait for it...) dodged them and attacked me. Keep them on topic. They can't stand that. Most of the objections that village atheists use logical fallacies that are essentially red herrings — distractions. Worse than that, they are methods of emotional manipulation used while they evosplain our stupidity. Mr. Friel discussed an article on Greg Koukl's Stand to Reason site by Natasha Crain titled, "A Parent’s Guide to the 5 Skeptics Who Want to Shame Your Kids for Being Christian". (Note from the Irony Board: last I knew, Koukl is an old earther, but he isn't bushwhacking biblical creationists.) Atheists ridicule Christians for believing in miraculous events like creation, the Genesis Flood, the Resurrection of Jesus, and other things, but believe everything happened by chance, from nothing. They have their own secular miracles. That's okay to them, because atheism. I have the excerpt that inspired this article below. You can hear the entire episode, free to listen online or download, by clicking here. Side note: I want to give credit for the service that made the audio-to-video-format easy, which is http://ez-converter.com. I'm planning of giving another bit of news from Wretched Radio next week. Yep, here it is: "Wretched Radiometric Dating and the Oldest Color on Earth".